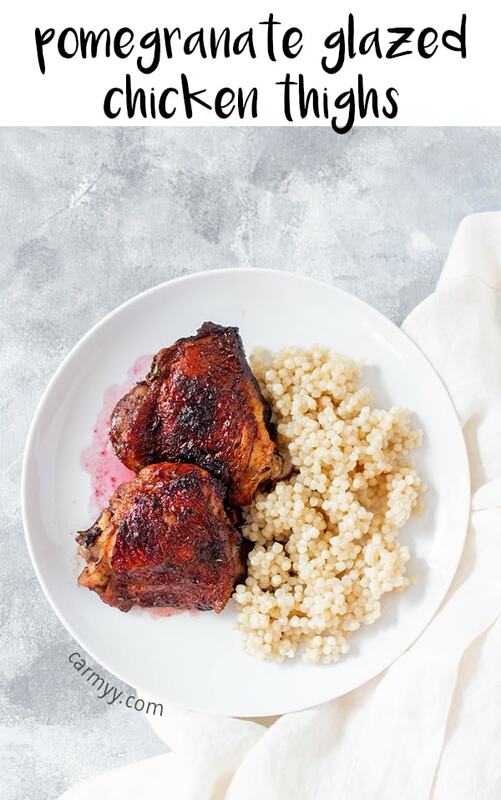 Juicy, sweet, and bursting with flavour, this Pomegranate Glazed Chicken Thighs makes for a perfect dinner or as a meal prep. The other way, I was flipping through Just Add Sauce, one of my many books that I buy but rarely flip through anymore because there is just no time in my day (!!! ), when a glaze caught my eye. It was pomegranate based and used brown sugar in the glaze. It sounded delicious but I wasn’t sure how I felt about using both pomegranate molasses in addition to brown sugar since that seems a little too sweet for me. After some Googling, I figured out that pomegranate molasses is pretty much just reduced pomegranate juice. 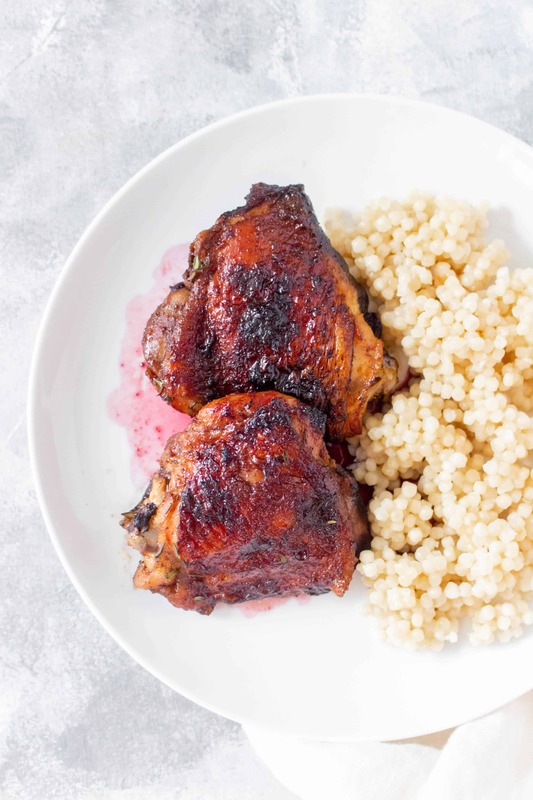 I decided I didn’t want to go out and buy pomegranate molasses for the recipe soooo I DIY-ed it and kinda threw in things here and there until I liked the result. 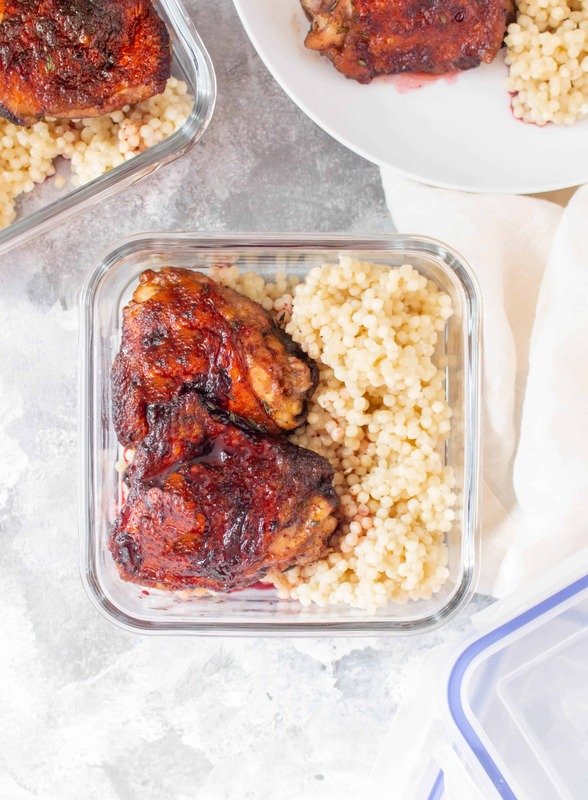 After testing it a couple more times, I am in love with the sweetness of this glaze and think it’ll be perfect for dinner if you’ve got guests or as a tasty chicken meal prep. 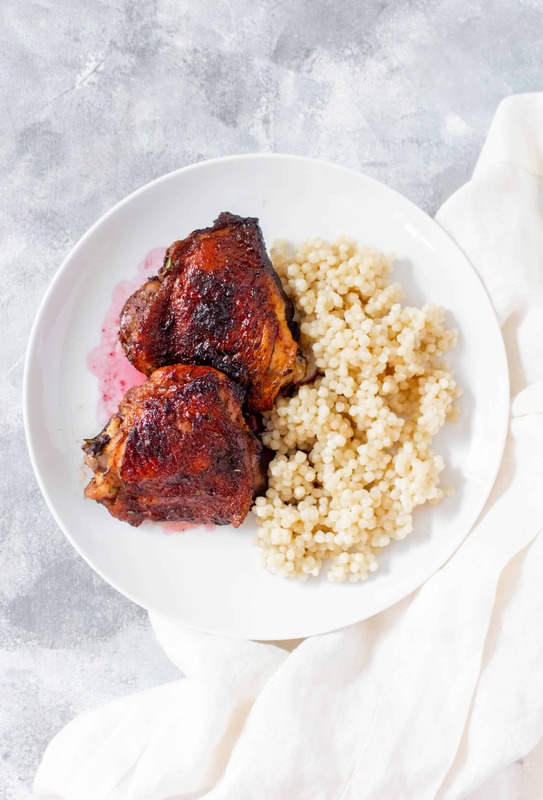 It takes extra time to reduce the pomegranate juice and making the glaze but I promise you, it is so worth it. In a sauce pan on medium heat, reduce your pomegranate juice until it’s 1/3 of the original amount. Once reduced, add more pomegranate juice, chicken stock, thyme, and bay leaf and reduce again. 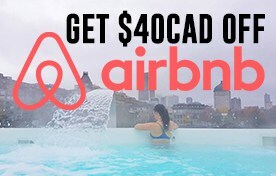 You should end up with around 1/2 cup of liquid at the end. Remove the bay leaf and thyme. Set aside half. 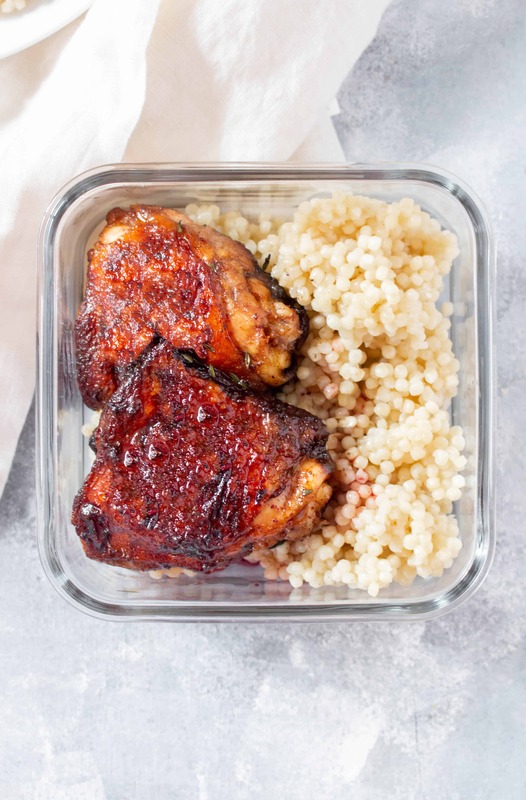 Season your chicken thighs with salt, paprika, and garlic powder and then on a cast iron that has been buttered/oiled, place your chicken thighs skin side down. Let the thighs brown (around 5 minutes) before flipping them over. 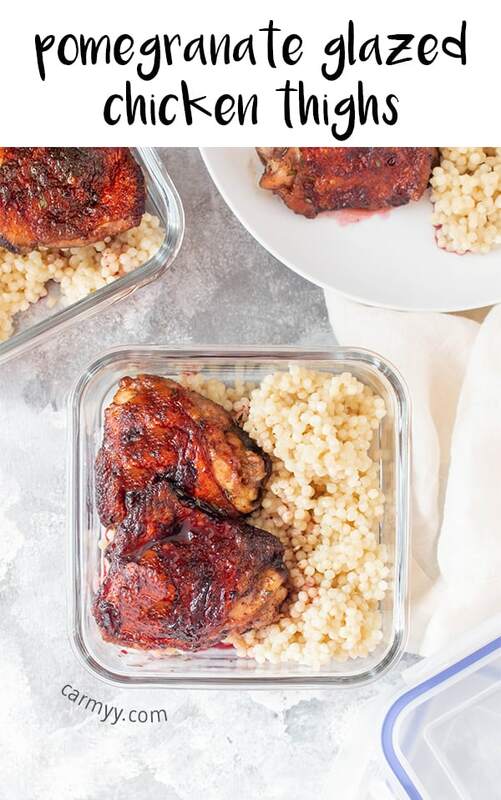 Brush your glaze onto the skin of the chicken thighs and let the chickens continue to brown (5 minutes). Brush the glaze onto your thighs again before putting the chicken thighs into the oven. Bake for 30 minutes, brushing the glaze onto the thighs at the 10 minutes mark and 20 minute mark. Keep an eye on the chicken thighs to make sure the skin doesn’t burn. If you have a meat thermometer, make sure the chicken’s internal temperature is 165F (75C). Drizzle the glaze that you had set aside earlier when serving. While the chicken is cooking, I cooked some couscous. You can also quickly steam some vegetables or roast vegetables on a separate rack with the chicken. I stored my meal preps in these airtight containers. 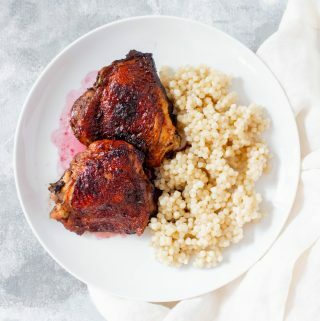 I used pure 100% pomegranate juice to make this pomegranate glaze. Be mindful when picking up your pomegranate juice that you are getting pure pomegranate and make sure it is 100% juice and no additional sugar has been added. In a sauce pan on medium heat, reduce your 1 cup pomegranate juice until it’s 1/3 of the original amount. This sound take around 10 minutes. Once reduced, add 1/4 cup pomegranate juice, chicken stock, thyme, and bay leaf and reduce again. You should end up with around 1/2 cup of liquid at the end. Remove the bay leaf and thyme. Set aside half. Bake for 30 minutes, brushing the glaze onto the thighs at the 10 minutes mark and 20 minute mark. Keep an eye on the chicken thighs to make sure the skin doesn’t burn. If you have a meat thermometer, make sure the chicken’s internal temputure is 165F (75C). If you notice the skin starting to burn but the chicken isn't cooked through yet, cover the top with tin foil or parchment paper to prevent the size from burning.